Bold colors and designs jump off the page with screenprinted Lokta origami paper featuring white floral blossoms on a bright yellow paper. Nepalese paper artisans hand-craft Lokta paper out of fibers from the bark of the Lokta bush and then silkscreen eye-catching designs onto the sheet. 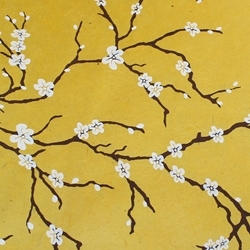 Inspired by the springtime flowering blossoms of the peach tree, the Peach Blossom Paper features intricate white floral designs with brown branches applied to an eco-friendly, sunshine yellow base color of this hand-made Nepalese Lokta Origami Paper.